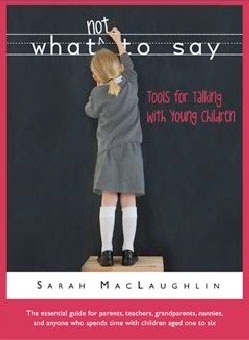 Read to the end of today’s post for your chance to win one of two copies of Sarah’s book: What Not to Say: Tools for Talking with Young Children. I actually do learn something new each day. And generally speaking this is a good thing. Unless you are writing a nonfiction book. At some point you have to finish the book-writing—editing—proofreading process. The additions and changes simply must stop. As it was, my less than 100 page book took about 10 years to come to full fruition. I certainly could have kept going. And going . . . .
My handy little book was conceived (yes, books feel like children in many ways) long before I was a parent. I was a preschool teacher actually. It was my third job working with young children. I considered myself pretty well-educated, and I had learned a lot on the job. Two preschools I’d worked in were NAEYC (National Association for the Education of Young Children) accredited. I’d attended a couple of conferences and done a lot of reading. Then I moved across town to a different school. A couple of the teachers there, including the director, were what I would call “old school.” It was a much more structured program and the expectations of the children were a little off. Then there was the language. I just couldn’t get over the language! Children were either good or naughty. There was coercion of the friendly-but-manipulative sort, but it was coercion just the same. There was an underlying notion that the children were competing with each other to “be well-behaved.” I didn’t like it, and I didn’t stay. This was a long time ago, and I’ve digressed. But, this is where my book became a twinkle in my eye. I stuck a small notebook in my bag, and whenever I heard a child being spoken to in a way that was disrespectful, manipulative, or insisted that they not feel what they were feeling, I wrote it down. The list grew long. My ears perked up in the grocery store, I added another note. I hung out on the playground with a child whom I was babysitting, I added more. The list grew longer still. Someone suggested that it could and should become a book. This is where the gestation started — and it was not a short one. I’m telling you all of this because I want you to understand that while I love my book, I don’t think it is perfect — far from it. Once I had that long list, it needed to be expanded. I had to back up my notions and solidify them with research and studies. My editor had to remind me that I was writing a guide for parents and teachers, not a thesis. I read, literally, every parenting book I could get my hands on. Then I got pregnant. For real pregnant. And I had a baby boy and then a toddler. Then Facebook happened and there was so much more information to sort through. Eventually, after more revisions than I could possibly count, I had to stop. I had to. After what seemed like an endless period of gestation and development (labor? ), I had to let my baby go — birth finally occurred. It was on paper — in print — hardbound. There was no turning back. BUT WAIT! I learned something new! I need to change that part. And then I found this website and that blog and now chapter two isn’t quite right. And this section here needs to be tweaked. Darn it. I guess I have to face the fact that I will always be learning. When Dionna of Code Name: Mama reviewed my book last summer, I was thrilled and honored. When there was honest feedback, I was delighted and horrified. Delighted because I knew it was right, and horrified because I couldn’t change any of it. But here I am on a blog tour! I can kind of make changes, and I can certainly respond to feedback. Of course as with any book, parents can take what works and leave the rest. For example, the author recommends parents use the “3 R’s”: Request, Remind, Reinforce. If a child ignores an adult request, remind the child of your request and “include the consequences for not complying.” If the child ignores the adult again, restate your request and impose the consequences. For families who are working toward cooperation instead of expecting children to blindly comply, this advice is probably not compatible. Yes, please take what works and leave the rest — there are some parts worth leaving. I would not print this advice today. I know differently now. Instead I might suggest a different three “R’s” as I wrote of in The Trifecta of Parenting: respect, relationship, and repair. Or Pam Leo’s three: rewind, repair, and replay. I really am always working toward cooperation. I don’t expect children to blindly comply. There are lots of places in my book that aren’t perfect, and there are lots of parts that are just great. In writing and in parenting, sometimes we don’t have all of the information or resources that we need. We make mistakes and don’t get it quite right. Other times, we nail it and feel fantastic. As they say, it’s never a good plan to throw the baby out with the bathwater. Thankfully, there are many places in the book that I still view as spot-on. Sometimes it is imperative that we acknowledge that we got it wrong. I’m happy to have done that here. Please comment on this post about ways you keep your communication considerate and kind to your children, so that you can enter to win a copy of What Not to Say: Tools for Talking with Young Children in the format of your choice: Hard cover, PDF, epub, or Kindle format. Sarah will be giving away one copy at each blog stop and will announce it on the comments of this post tomorrow. Be sure to leave your email so we can contact you in case you’re the winner! Other stops during this Blog Tour are listed on Sarah’s blog. Also, be sure to enter at Sarah’s site for the Grand Prize Giveaway: a Kindle Touch. Winner will be announced at the end of the tour after July 15th. Enter via the Rafflecopter widget below. Contest for the BOOK ONLY closes June 30, 2012 at 11:59 p.m. Eastern Time. Sarah MacLaughlin has worked with children and families for over twenty years. With a background in early childhood education, she has previously been both a preschool teacher and nanny. Sarah is currently a licensed social worker at The Opportunity Alliance in South Portland, Maine, and works as the resource coordinator in therapeutic foster care. She serves on the board of Birth Roots, and writes the “Parenting Toolbox” column for a local parenting newspaper, Parent & Family. Sarah teaches classes and workshops locally, and consults with families everywhere. She considers it her life’s work to promote happy, well adjusted people in the future by increasing awareness of how children are spoken to today. She is mom to a young son who gives her plenty of opportunities to take her own advice about What Not to Say. More information about Sarah and her work at her site and her blog. participating in her blog tour. That is a great distinction! My daughter is still little, but I try and talk directly to her and not yell if she’s doing something she shouldn’t. Not yelling is so important because it can frighten kids–and when kids are scared, they can’t think well! I try not to raise my voice & keep calm. What a lovely way of putting it! We have a 4 year old daughter who is constantly challenging us and while we understand this is all part of her development we still could use all the help we can get. I think the best advice I have is to live by example. If I want my child to be kind and considerate I in turn am kind and considerate to others. I know the book contest is over but I wanted to enter for the kindle, at least. Thanks for a great one, btw. I always try to make sure that we end any conversation where we have to deal with negative things with a hug and something positive (like encouraging words or a positive attribute about our son). Can’t wait to try out your quinoa chocolate cake recipe!